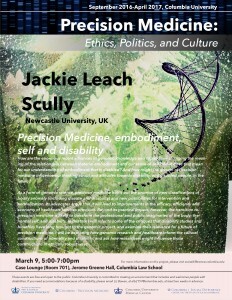 On March 9, 2017, Dr. Jackie Leach Scully, Professor and Executive Director of PEALS (Policy, Ethics and Life Sciences) Research Center at Newcastle University in Newcastle, UK, led a thought-provoking and insightful seminar and discussion on “Precision Medicine, Embodiment, Self & Disability” as part of CSSD’s project on Precision Medicine: Ethics, Politics and Culture. Dr. Scully largely explored biomedical perceptions surrounding disability, and proposed how these perceptions are and will continue to change within the era of precision medicine. Traditionally, biomedical views have largely considered disability as a nominative and quantifiable pathology with less consideration for cultural, environmental, social, economic and political aspects. And while precision medicine remains rooted in this conventional biomedical perspective, rapid advances in the field are posing new bioethical questions and challenges that will continue to shape not only the biomedical but also the social/societal perceptions of disability. Dr. Scully dove into a variety of such issues that we are currently facing and those that will likely be forthcoming. For example, paradoxically, individualized probabilistic data of genomic abnormalities obtained in the preconception/prenatal setting can effectively uncouple genetics from physical manifestations (the “walking ill”), thereby resulting in unjust discrimination—where the concept of disability exists prior to the individual’s embodiment and identity have taken form. This challenge reflects the central question of how precision medicine’s attitude toward “disability” differs from that of “disease.” While medicine in general rationalizes the avoidance or elimination of disease, will this rationalization inevitably apply to genetic variation associated with disability? And how will our society come to these decisions regarding what type of genomic variation we consider “abnormal” and appropriate for preconception and prenatal modification such as through preimplantation genetic diagnosis or in the near future, gene editing techniques. With the surge of funding for precision medicine research over the past three years, Dr. Scully makes the case that we should allocate a portion of this funding to monitor the ethical ramifications surrounding these biotechnological advances in effort to keep up with the rapidly evolving landscape of precision medicine.